Rugby season is back in full swing and we’ve started the routine of ice packs and Advil. I recall post about my son’s first match last spring … and now a year ‘wiser’ I thought he would be playing the game a little bit more gently? I am wrong and have evidence to prove it. 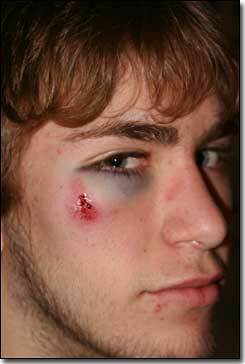 According to Taylor, the ‘head to the face’ bump he took looks worse than it feels (hard to believe), and although the black and blue eye looked painful, it was his finger and wrist that bothered him more. He of course went out after the game (not too smart) before coming home, and after sleeping with a cold pack his eye looked even worse in the morning. I took him to the doctor ‘just in case’ since the bloody eye bothered me. 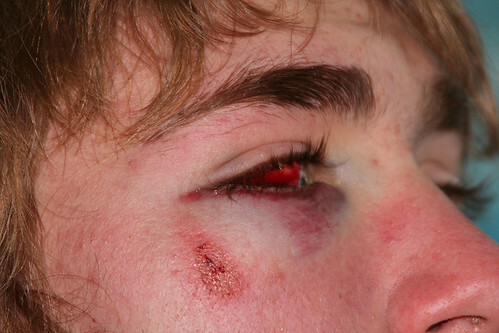 (subconjunctival haematoma) Ice, Advil and time was the prescription and according to the doctor “it is somewhat common to have blood vessels in the eye rupture” — of course my son’s question was whether he would be okay to play on Friday! Oh … and it looks like someone came by last night to cheer him up. 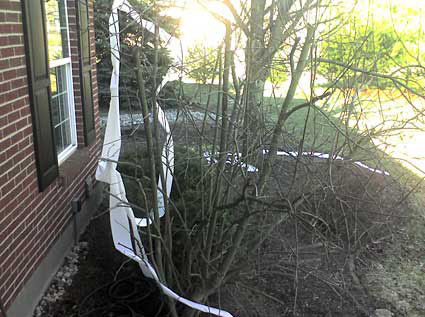 (photo below) It was nice of them to leave a few unspoiled TP rolls too … I wonder if our dog sprinting around the corner had anything to do with that?